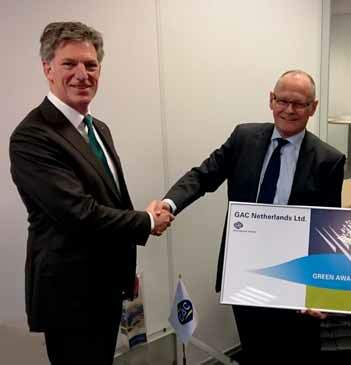 As part of their continuing commitment to supporting environmental issues, GAC Netherlands and GAC Belgium have signed up to the Green Award (GA) Foundation's incentive scheme. Under the agreement and with immediate effect, ships that are GA-certified and which utilize GAC's ship agency services at ports in either country can claim a 5% discount on GAC's agency fees. Responsibility.” GAC is one of the world’s largest ship agencies with a long standing reputation for quality service. Handling more than 60,000 port calls annually through a worldwide network consisting of more than 300 GAC offices in over 50 countries and carefully selected network partners in all other locations, the company is a keen supporter of environmental initiatives. GAC is a global provider of integrated shipping, logistics and marine services. Emphasizing world-class performance, a long-term approach, innovation, ethics and a strong human touch, GAC delivers a flexible and value-adding portfolio to help customers achieve their strategic goals. Established since 1956, GAC employs over 10,000 people in more than 300 offices worldwide. Green Award certifies sea-going oil and chemical tankers, bulk carriers, LNG carriers, container carriers and inland navigation barges. Its assessment criteria cover environmental, quality and safety aspects, and performance of management and the crew. With this comprehensive approach and a diverse team of the industry’s experts supporting the scheme, Green Award secures the quality of its audits and real value of its certificate. With over 50 ports and other maritime related organizations providing discounts to the certified companies and ships, the scheme motivates ship owners and managers to invest in the improvements on board and ashore and serves as a reliable Corporate Social Responsibility and risk reduction tool for participating shipping companies, ports and maritime service providers.